"I Wish I Had Used Costa Rica Dentist Dr. Mario in the First Place..." With free video. Home | Real Estate | Costa Rica Videos | “I Wish I Had Used Costa Rica Dentist Dr. Mario in the First Place…” With free video. How do they do that? Very easily… they promise something for almost nothing.. The end result, many times, is less than stellar and at times catastrophic. There is no free lunch! For the past four years I have worked with individuals who have been looking for dental work in Costa Rica at a substantial cost savings over what they would pay in the US. That’s a fair objective and one that I can support , but there has to be a rational limit to saving the last dollar. There was a thread posted recently on Scott’s blog by a woman who wrote, quite bravely, of the mistake she made in selecting a dentist that failed her, not only the final painful results of her dental work, but ultimately a greater financial burden. Put this header in the article somewhere if space permits. She insinuated that she had been ‘sold’ by a dentist who obviously made promises of getting great dental results while saving even MORE money than other dentists in Costa Rica. Its not all the dentists fault. We set ourselves up for this. We ignore the warnings that our common sense prevails upon us and count all the MORE money we will save. All the flashing red lights are ignored. This woman wrote that she wished she had used Dr. Mario. Why was that? Because the dental work performed at the ‘best price’ was a total disaster and left her in pain for several months before she had to spend multiple thousands more to correct the bargain dental work. Dr. Mario does not sell dental work by the pound. Yes,we are very fortunate here in Costa Rica to have economic and legal systems that do not work to make quality medical care financially out of reach. For those of us who live in the US and Canada this provides the opportunity to receive state-of-the-art dental procedures at substantial savings. You can take this to the bank with you. Even in Costa Rica there will be associated costs with quality dental work, performed by well trained, certified professionals who can save you thousands of dollars with guaranteed results. When you begin researching dental care and dentists in Costa Rica you can reasonably start with the assumption that you will save approximately 40% on your dental care. In fact, Dr.Mario guarantees a 40% discount against your US or Canadian dentist written treatment plan. 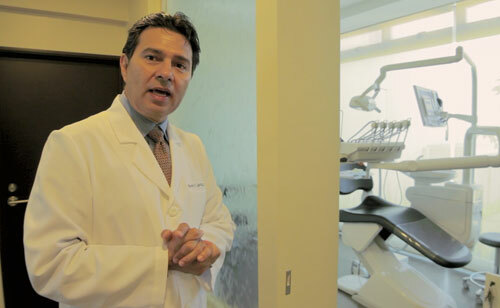 Yes, that Dr. Mario, graduate of the University of Miami School of Medicine, implant specialist, in practice for 22 years, referred by the US Embassy in Costa Rica for dental work, member of the ADA (American Dental Association) and operating in a new multi-million dollar, English fluent, hi-tech facility in the heart of San Jose’ business and entertainment suburb of Escazu. Now if you want to save 42, 45,47 or even 50+% on your dental work then check the web for all the promises of saving even more money while ignoring your common sense, red lights flashing before your eyes, sirens screaming in your subconscious and never asking the questions you know you should ask the dentist on the other end…or maybe really don’t want to know. Are you certified as a implant specialist? The reason for asking this question is that general dentists are not trained or licensed to do dental implants, bone grafts and sinus lifts. Are you certified to do root canals? Same as above. Dentists who do root canals have to be licensed and trained to do root canals. For example Dr. Mario has Dr. Paoula, who is trained and certified to perform root canals, come from her private practice to do root canals for Dr. Mario’s clients. Is the office English fluent? Do I really need to explain this?Anyway my friends, I will promise you that with Dr. Mario, and with friendly assistance by yours truly, you will realize substantial savings, at least 40% on your dental care, performed by a brilliant young dentist with all the proper certifications and accreditations, in a state-of-the-art facility, with all dental work 100% guaranteed and qualify for a 500.00 airfare rebate, then your search is over…, otherwise, you can roll the dice and save another 100 bucks. Dental Coordinator Charlie Dennard and our safe and affordable Blue Cross Preferred Costa Rica Dentist Dr. Mario who will make you look better and feel healthier for a whole lot less! Dr. Mario has been in private practice for over 20 years providing high quality dentistry at an affordable price to patients coming from the United States and Canada. The average savings is 40-50% over US and Canadian dental costs. Hi, Please fill out the brief contact form at the bottom of this page and you will be put into contact with Charles Dennard our patient care coordinator who can answer all of your questions! thanks! I see that in the advert Dr Mario is a Blue Cross recommended Dentist- I take it that if we have Blue Cross Dental Insurance from the USA he will accept that in part payment for his services.? Yes, I believe that’s what it means but you’ll need to talk to Charlie directly to confirm that. You can reach him using the contact form on this page.